c) promoting and maintaining proper professional standards and conduct for members of that profession. The GOsC keeps the Register of all those permitted to practise osteopathy in the UK. We work with the public and osteopathic profession to promote patient safety by registering qualified professionals and we set, maintain and develop standards of osteopathic practice and conduct. We help patients with any concerns or complaints about an osteopath and have the power to remove from the Register any osteopaths who are unfit to practise. 'Our work' explains in more detail what we do, including our aims and vision, our key plans and policies, and how we do our work in 'Our performance', which also includes our complaints procedure. Certain aspects of our work such as international regulation, our Patient and Public Partnership Group, social media, freedom of information and our Welsh Language Scheme are focused on in more detail. In 'The organisation' section there is further information about the structure and governance of the GOsC, details of Council and Education Committee meetings, including papers and minutes, contact details for departments and functions and recruitment vacancies, when applicable. Also in this section are pages on the legislation that governs our work, the other UK health and social care regulators and how we work with them, directions to our office and details about the meetings accommodation we have for hire. We are currently inviting patients and members of the public to join our Patient and Public Partnership Group to provide a patient and public perspective on our work and assist in developing GOsC communication materials. For further information about joining the group visit our Patient and Public Partnership page. 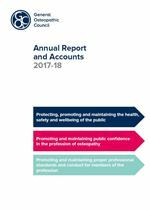 Each year, we produce a formal report outlining the work we have done in the preceding year. These are available in the Annual Reports section. We welcome comments and feedback about this website and the information on it. If you have any comments or if you have not been able to find the information you want in this section or on the website as a whole, please contact us by using the form on the Contact us page or by emailing info@osteopathy.org.uk.